When something is easy or effortless, it is sometimes called a “cakewalk.” Suzy was first introduced to the term at her high school fair, where she bought a ticket, walked in a circle, music played, a number was called, and someone handed her a cake. She had to carry it home on her bike…but come on, it’s basically a free cake. If that happened every day, life would be a cakewalk, and I would eat a TON of baked goods. Anyway, I digress. 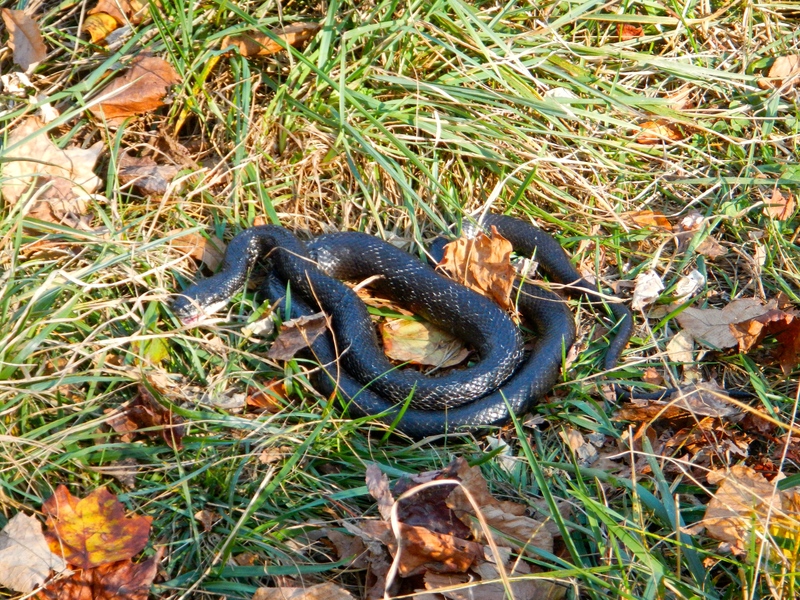 This weeken d’s cakewalk was a bit more involved–a six mile hike, two frybakes, 34 pieces of charcoal, a snake, and a windstorm—but it was worth it. 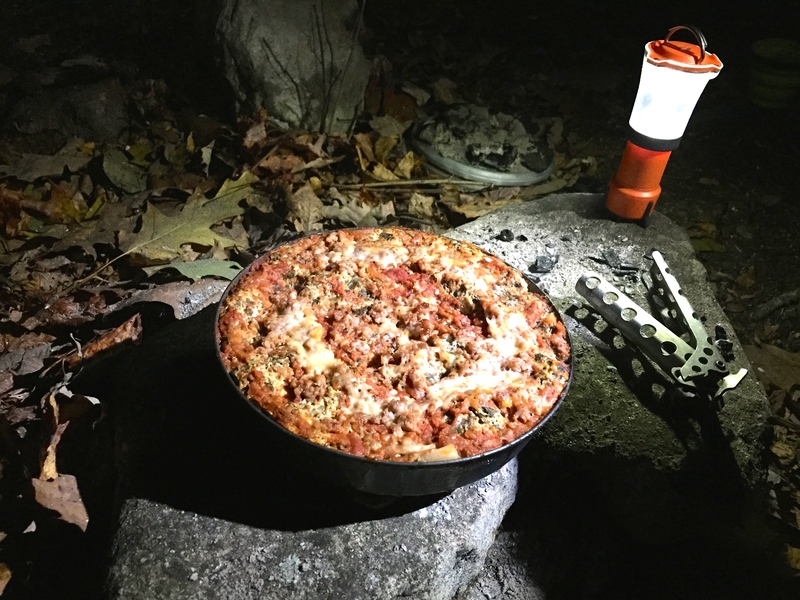 We’d never made cheesecake or lasagna in the backcountry before, so we decided to do both while enjoying the brilliant fall colors. 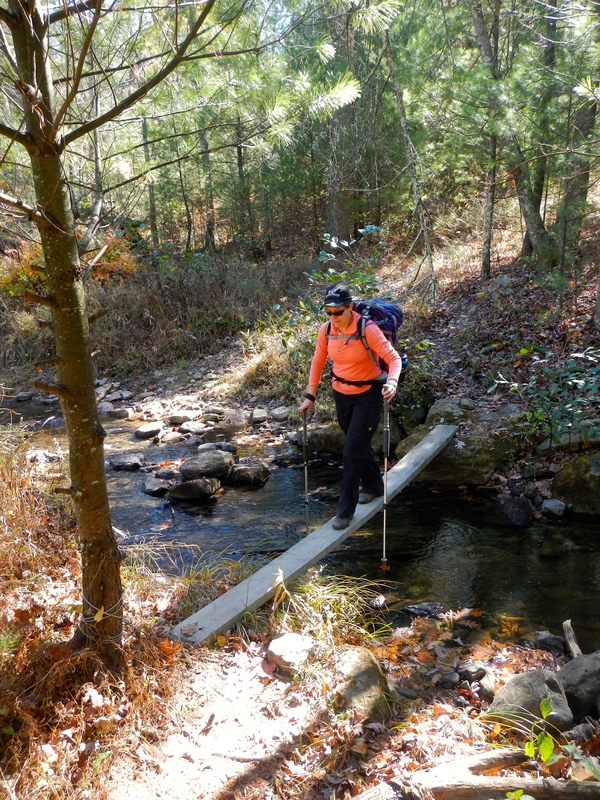 Our trail of choice was Racer Camp Hollow, near Great North Mountain on the Virginia-West Virginia line. At the trailhead, we ran into a big group from the Georgetown University Outdoor Club, which hit the trail just ahead of us. 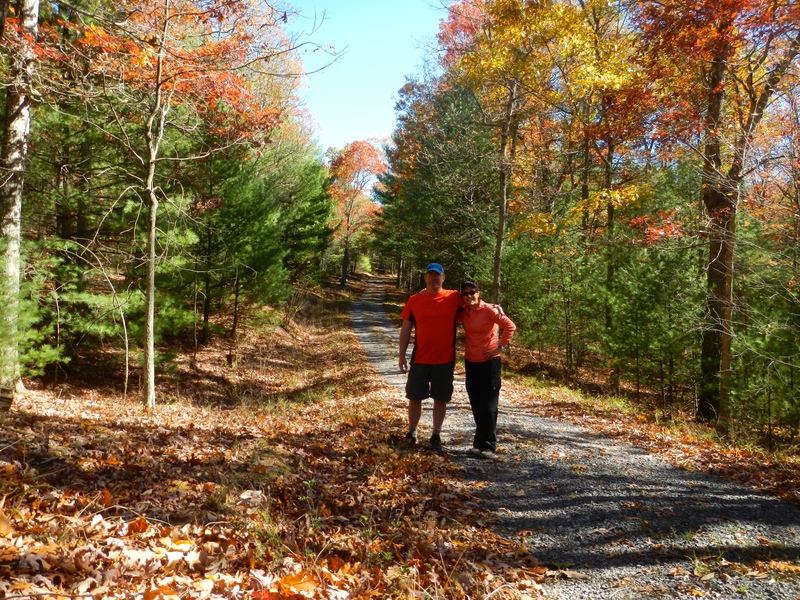 It’s great to see other kindred spirits out enjoying nature, especially the next generation. 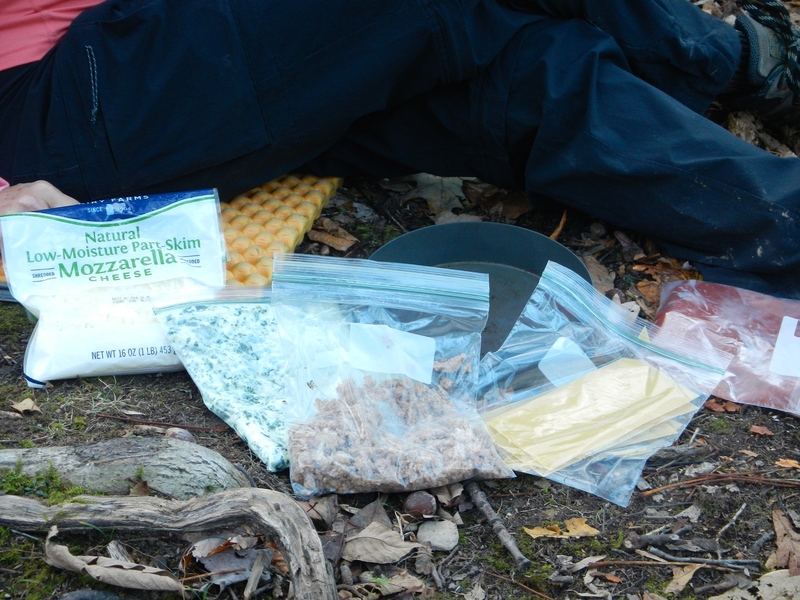 As for the meal, we assembled the ingredients ahead of time and froze them in ziplock bags. 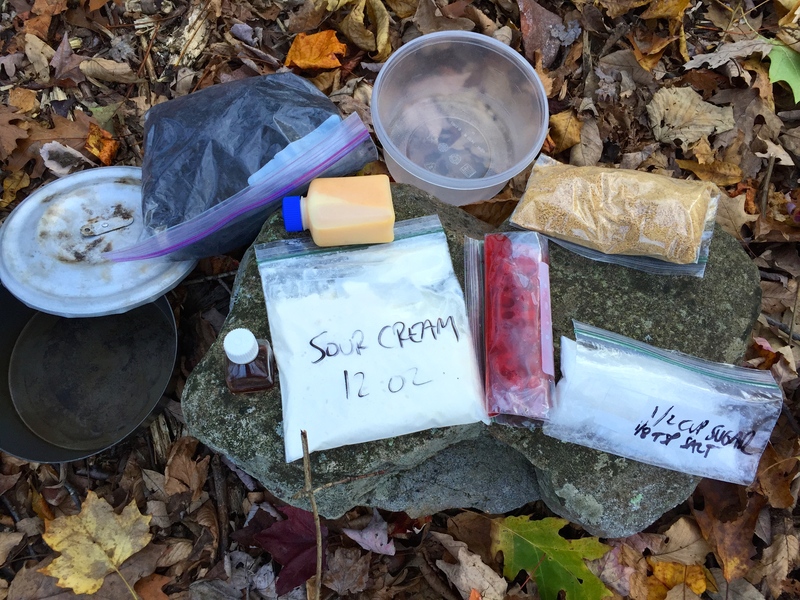 We also carried charcoal, a spatula, and two extra plastic containers for mixing bowls. 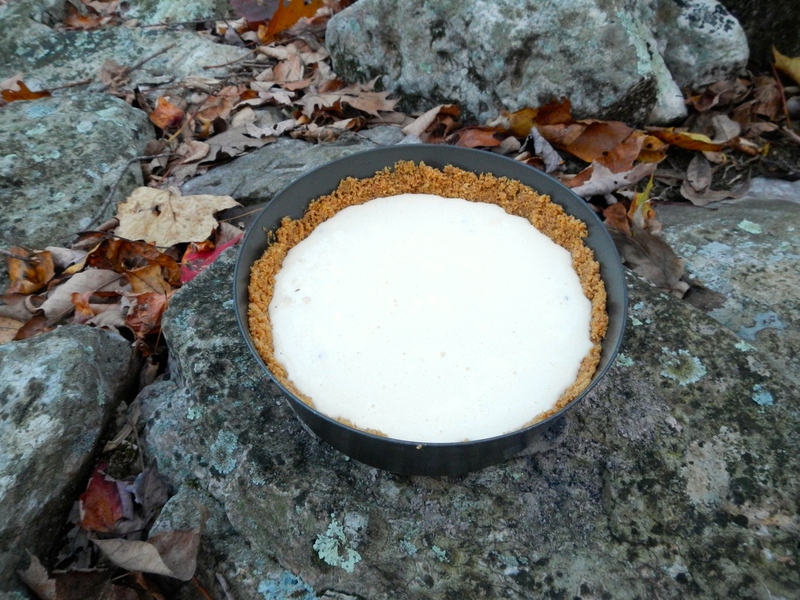 Lastly, we carried a foil pie tin, which weighed next to nothing and worked well for keeping things warm by the fire. In late afternoon, we found a nice camp well up the trail, set up our tent, collected some wood, and set our sites on dinner. 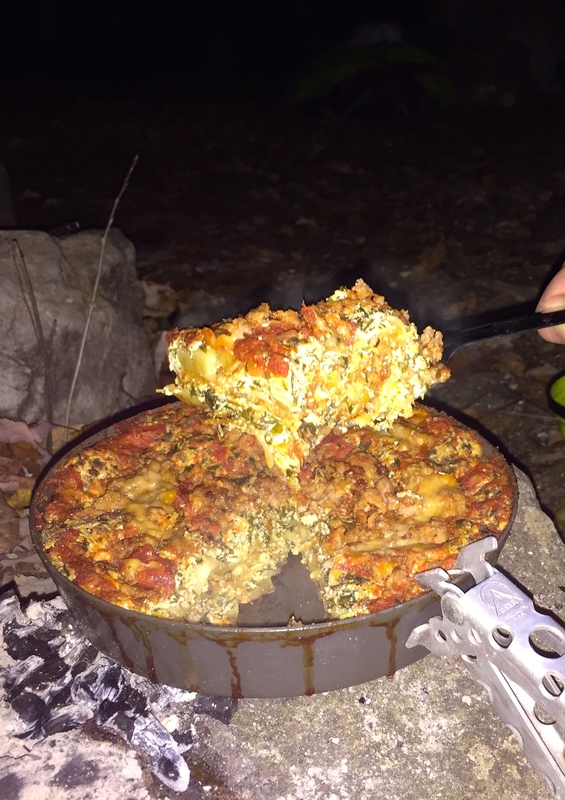 Souzz took the lasagna, and I took the cake (so to speak). 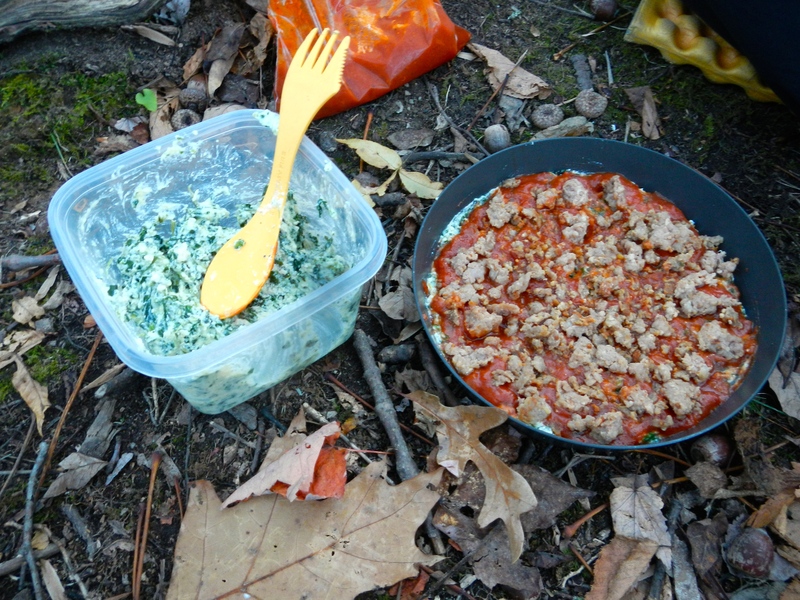 For the lasagna, we used no-bake noodles, sauce, ricotta/spinach/eggs, sausage, and mozzarella. 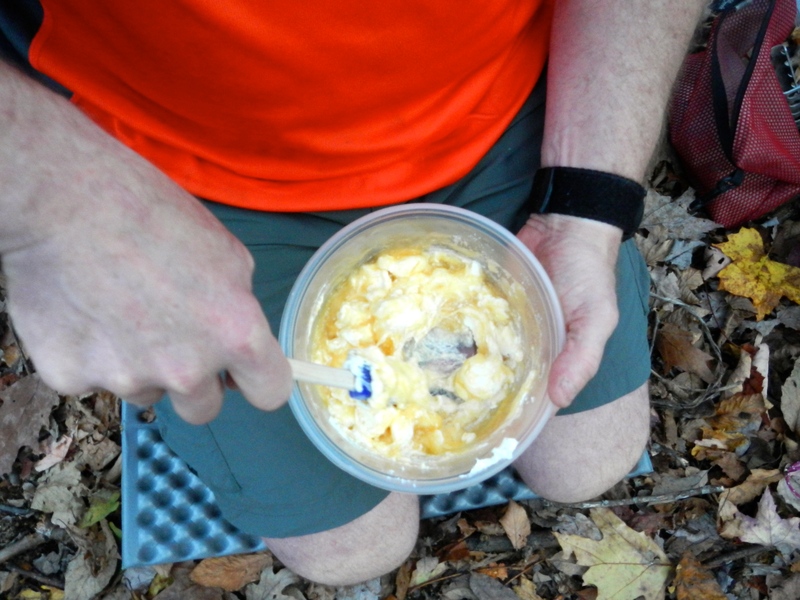 We carried the eggs pre-scrambled in a small plastic Nalgene bottle and added that in to the ricotta mixture at the last minute. Most of the rest was pre-mixed. Prep was actually pretty easy, about 15 minutes, and the cooking took about an hour and fifteen minutes (18 coals split top/bottom). It’s trite to say it was worth the wait, but it’s also true. And we enjoyed a nice fire, garlic bread, and a few appetizers while we waited. I’d give this dish a full five sporks on the Souzzchef rating scale. 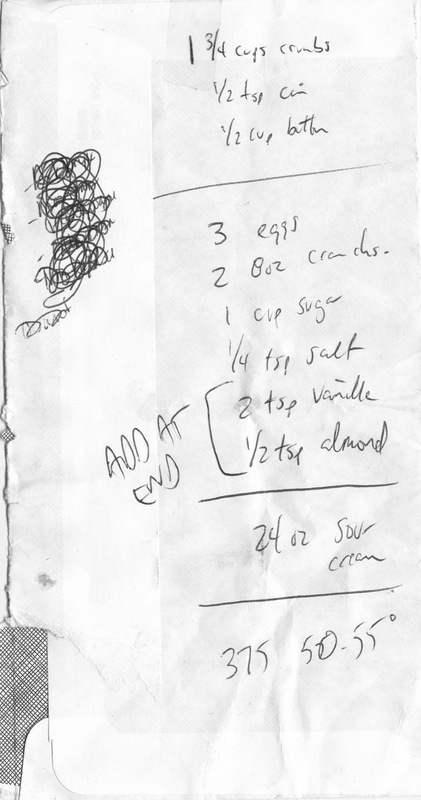 original recipe, written on an envelope! Cheesecake prep was similarly easy, maybe 15 minutes. 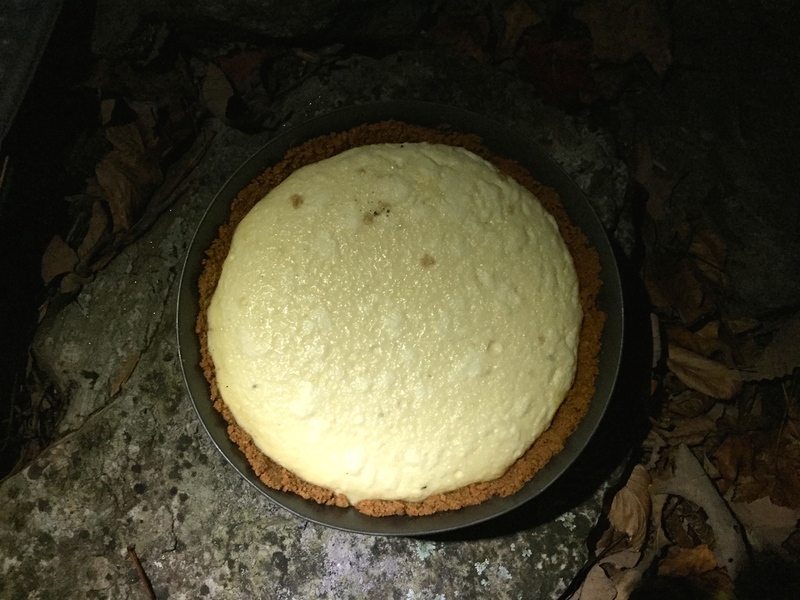 We used a package of graham crackers and third of a cup of butter for the crust, and 12 ounces of sour cream, eight ounces of cream cheese, two eggs, a half cup of sugar, a dash of salt, a teaspoon of vanilla, and a half teaspoon of almond extract for the filling. 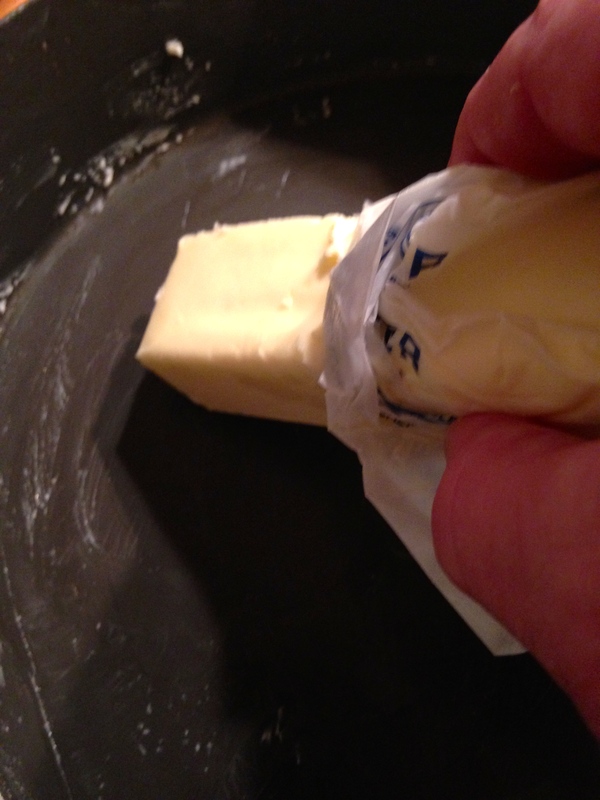 For the crust, we melted the butter over the stove and stirred in the crushed crackers. 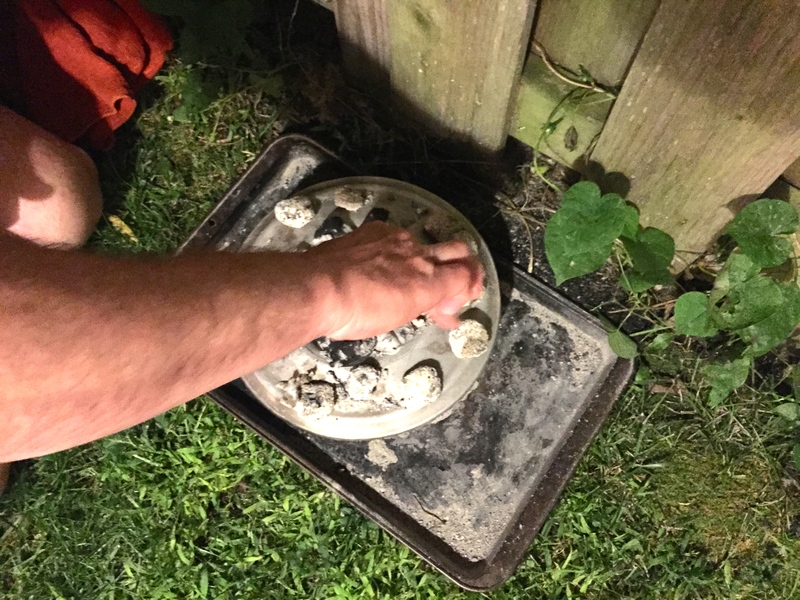 We assembled the filling, poured it in, and baked for about an hour and 20 minutes (eight coals on top, eight coals on bottom, adding some coals from the fire at the very end). For this dish, we used a “deep alpine” frybake (3 inches deep, a prototype not yet for sale but likely to be on the market soon). A wind break would have helped, as cook time was slowed down by a light breeze, but that at least helped cool the cake afterwards. 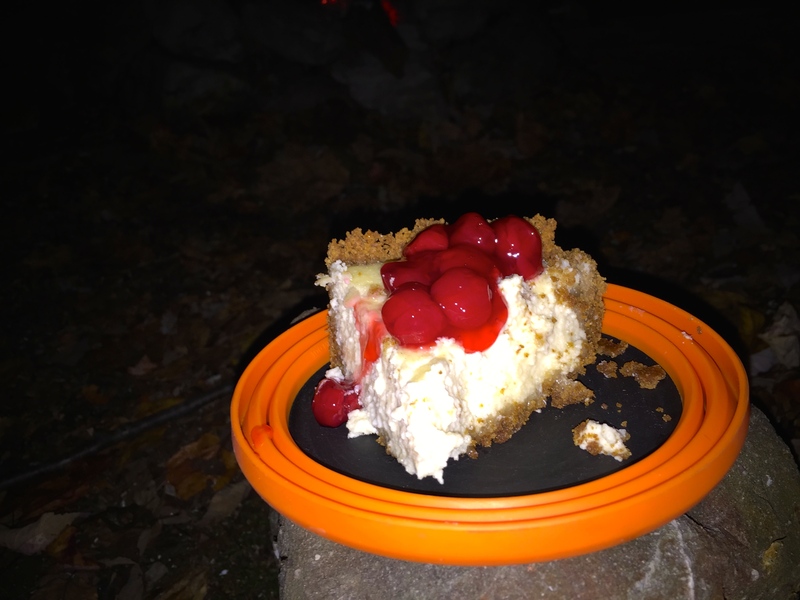 We added cherry topping and we had ourselves a nice fall treat. The only thing we’d change is to avoid freezing the sour cream ahead of time, as it lost its consistency during the freeze/thaw. 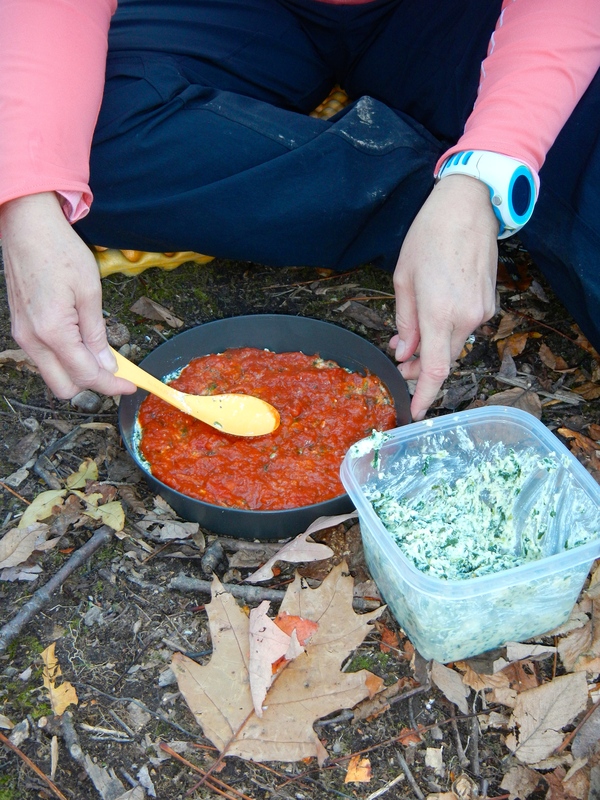 As a result, the texture wasn’t even…so I’m only rating it four out of five sporks. There’s got to be a way to carry along some makeshift refrigeration, perhaps wrapping the sour cream with the other frozen ingredients. Still, the cake was very good. With dinner done, it was time to sleep. Some years back, I took a mountaineering course and was told that I was sloppy with my gear–that one day something important was going to get blown away or covered in snow. So my custom now is to pack camp tight before heading to bed, with everything bolted down in case of a surprise storm, an aggressive raccoon, or both (and I would totally post photos if a raccoon ransacked camp in the middle of a storm, as that would be kind of cool). Lo and behold, the wind picked up in the middle of the night, and several times we were woken up by 35 mph gusts. So many leaves were hitting the tent that I actually thought it was raining. 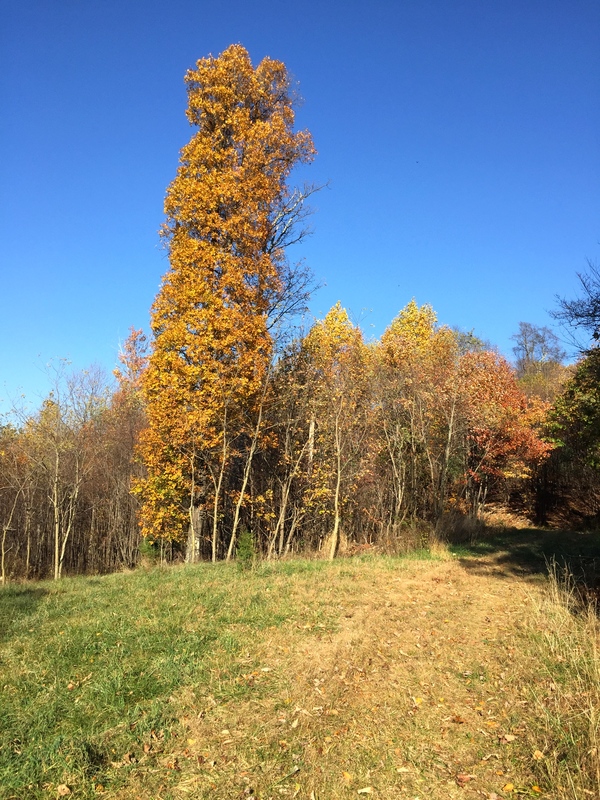 We emerged in the morning to see that the wind had stripped the trees almost bare, and we had seemingly gone from fall to winter in a single night. 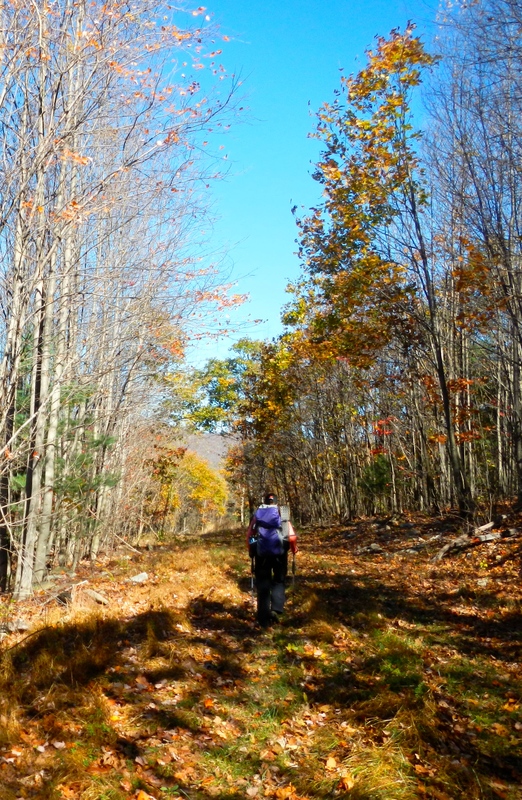 Two hikers that passed us in the morning shared stories of holding onto their tent fly with both hands, exciting stuff. 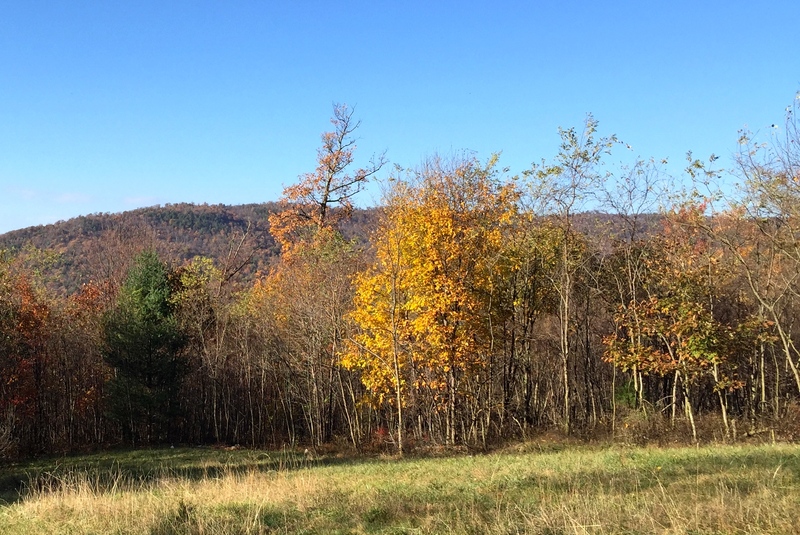 We made coffee and a nice breakfast and marveled at how different things looked with all of the leaves gone. The weekend wasn’t easy or effortless, but it sure had turned into a fun trip. And then Suzy handed me a piece of leftover cheesecake. Did someone say cakewalk? First, some background: a few months back, we had a scheme to catch Dungeness crabs while on a kayaking trip in Glacier Bay, Alaska. 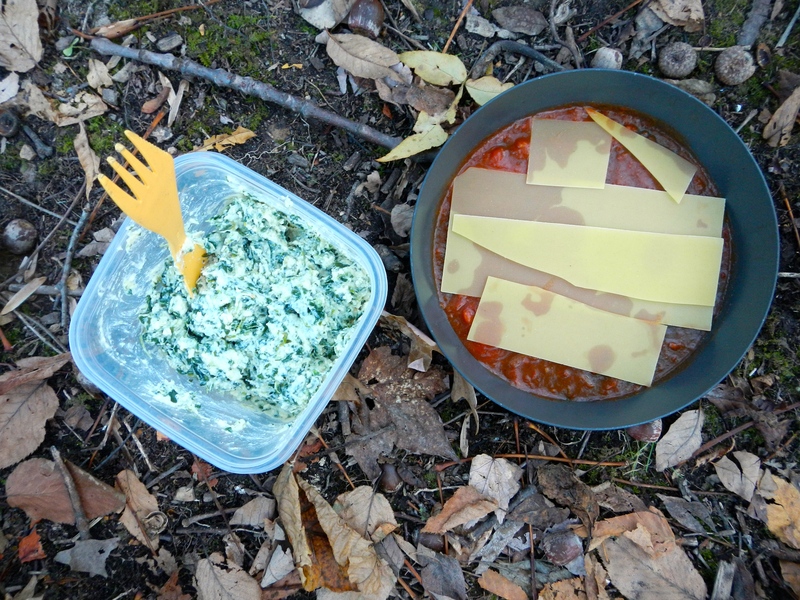 The plan was to cook them in camp using two tin foil lasagna pans as a makeshift steamer, and then to brag for years about how we lived off of the land (or, rather, the sea). 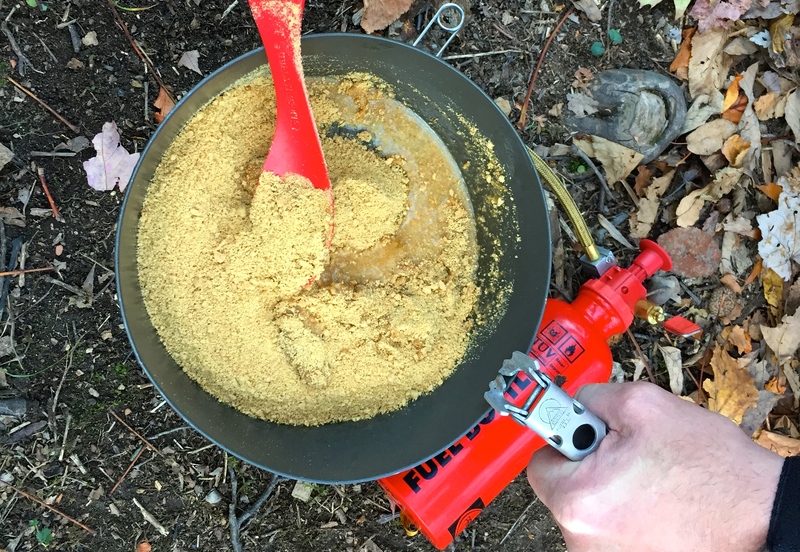 It all sounded perfect…until our traps came up empty and we sat in the rain eating dehydrated beef stroganoff. Good times. Last weekend, our friend Ellen invited us to join her and some close friends/family for the weekend at a house on the Delaware shore, and the crab scheme was reborn. Once we arrived in Lewes, the good folks at Bill’s Sport Shop were kind enough to point us to a local hotspot on nearby Love Creek. Gear in hand, we headed out at low tide with high hopes. My dad taught me as a kid that low tide isn’t really the best time for crabbing–but we still found a pretty active scene. We left with a modest catch of eight legal-sized (5+ inches tip to tip) blue crabs, and we caught and released loads of smaller ones. All were landed with either basket traps or hand lines. Souzz was skeptical that crabs would be dumb enough to hold onto bait (in our case, a drumstick) while a hand-line was pulled to the surface…but we landed quite a few that way. Turns out that crabs have brains the size of a point on a pencil, so there is apparently very little math going on down there. Think of it this way: if you saw an uncooked drumstick hanging from a string in the ocean, would you eat it? Unlikely, right? As the crabbing action picked up, twelve year old Ciara was our unofficial cheerleader, hopping with excitement with each successful retrieve. 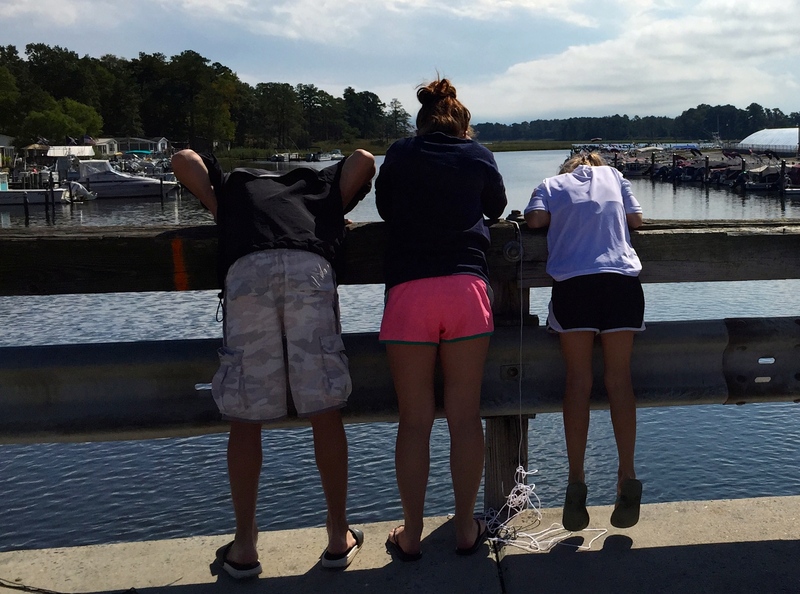 Fourteen year old Michael was our key grip with the net, and fourteen year old Nell provided help in measuring our catch–so it really was a team effort. We also made friends with Mitch and Roger, two locals who were happy to share their insights and even offered up an extra trap. Maureen and Mike provided running commentary, as well. 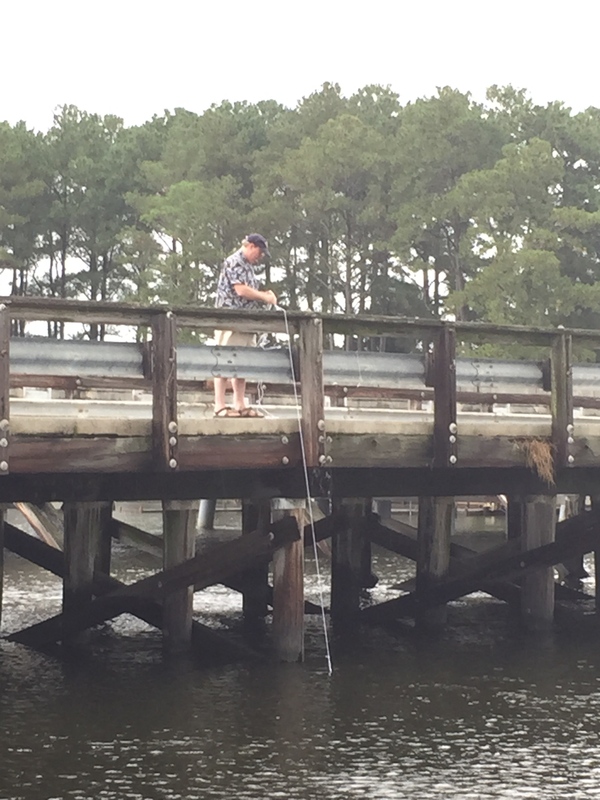 Crabbing is certainly more social than fishing, maybe because there’s plenty of time in between retrieves. Back at the house, we found that blue crabs fit easily into the fry-bake, so the tin lasagna pans weren’t called to action (a future blog awaits). We steamed the crabs in beer and added a bunch of Old Bay seasoning, and they were cooked and gone in no time. And we all agreed that they were much better than dehydrated stroganoff. But wait, we know what you are thinking: who eats steamed crab without apple pie?! 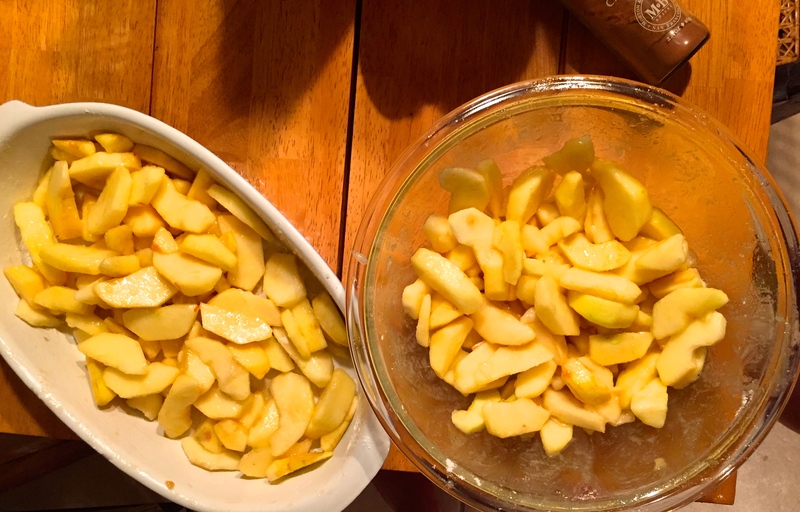 Being smarter than the average crab, we’d thought ahead about dessert and had brought some gala and honey crisp apples from a local farmer’s market. 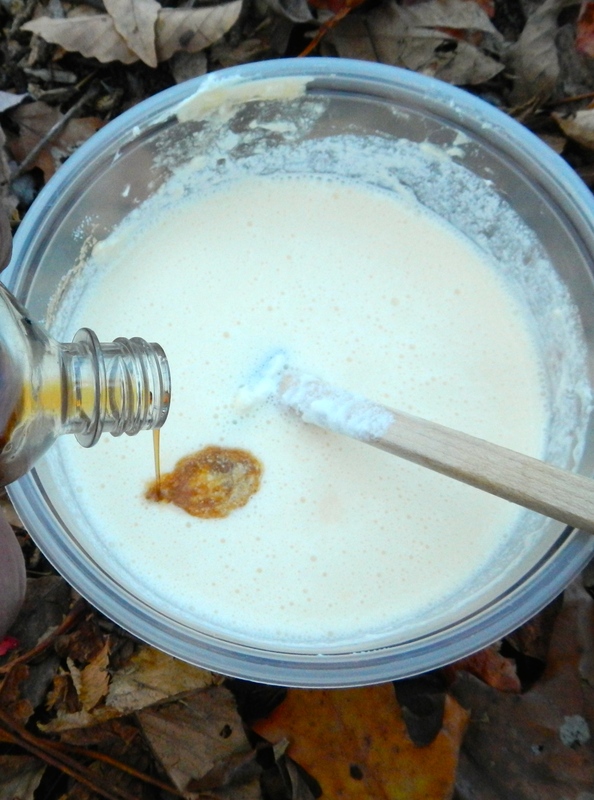 We added cinnamon, ¾ cup sugar, a teaspoon of lemon juice, a tablespoon of flour, and a few dabs of butter. All of that went into a pretty standard (read: store-bought) crust. 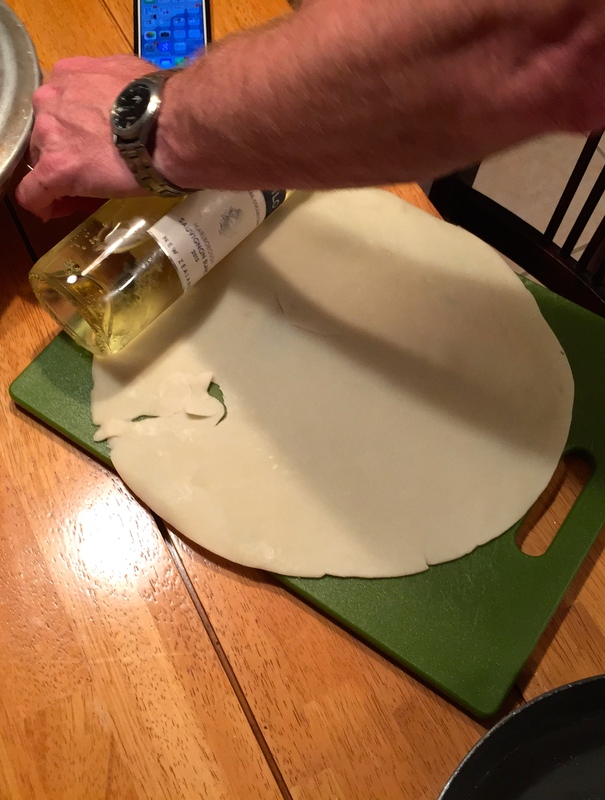 I hid the packaging and created an elaborate story (read: lie) about how we made the flour by hand–but I did at least use a wine bottle as a rolling pin, so there was some creativity involved. 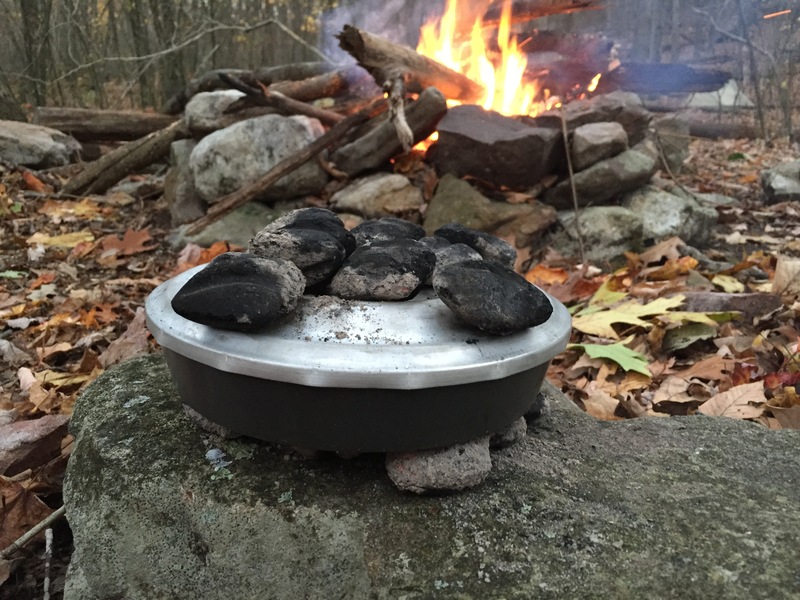 For the dutch oven, we used 10 coals on the bottom and 8 on the top. From there, it was just a matter of time, and it took a full hour and 15 minutes (it was windy out, which didn’t help). 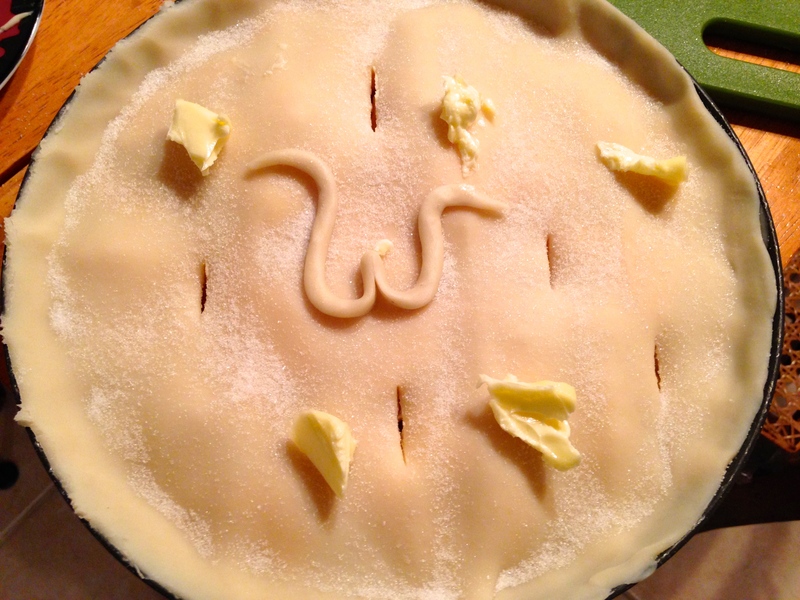 The curly W on the crust was Michael’s idea, as he’s a big Washington Nationals fan. It didn’t help the Nats, though, as they lost to the Giants in 18 innings. Thankfully, the pie turned out better than the baseball game. And is there anything more American than baseball, crabs, and apple pie?